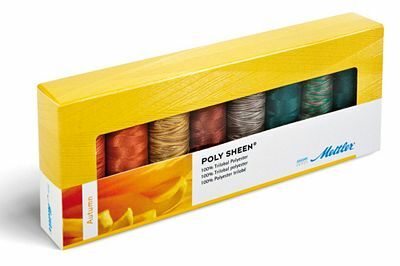 Contains 8 spools of Polysheen thread in Autumn colors. 8 X 220 yard spools. Colors- Date 1311, Coffee Bean 1344, Chocolate 1876, Swamp 5335, Coffee Blends 9927, Fire Flames 9934, Golden Harvest 9975, Forest Woods 9982.